You’ve already selected the perfect wine to pair with your meal or to relax at the end of the day. But don’t stop there. 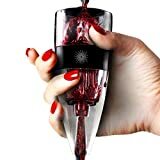 Turn your bottle of wine into a delight for the senses with a wine aerator. If you’ve never used one of these before, then check out our guide below on what to look for when buying one and how to get the best use out of it. What’s The Difference Between Decanting And Aerating? How Do I Use My Aerator? How Long Should I Aerate? 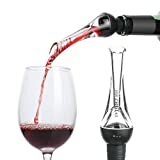 A wine aerator is an accessory used to add oxygen to your wine. You would be right to be a little confused since it is commonly known that failure to maintain the seal on a bottle of wine results in a sour vinegar taste attributed to the fact that the wine has become oxygenated while stored. However, when opening a well-sealed bottle, allowing the wine to “breathe” and expand for a short period allows the flavors to peak without turning, and the full bouquet of aromas to reach your senses. You can choose one of two common methods to aerate your wine. Traditionally, wines were decanted, or poured from the bottle into a separate decanter and allowed to rest a few hours before serving. While allowing the wine to rest is still a popular practice, today you can also use a wine aerator accessory to add oxygen more quickly. 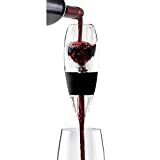 Wine aerators are available in styles you can hold in your hand, attach to the bottle, have their own support tower or are electronically processed. Decanting evolved not just to add oxygen to the wine but to remove the sediment that had built up in the bottle over time. By holding the bottle at the appropriate angle, you can eliminate the sediment from your glass of wine. Sediment is harmless but the texture and taste can impair your enjoyment of the essence of the wine. Similarly, today you can find wine purifiers. Specialized filters that remove sulfites from wine, they are available for use either on a full decanter or individual glasses. In addition, presenting wine in a special decanter is more elegant than just pouring from the bottle in which the wine has been stored. Aerators are designed solely to oxygenate the wine, and not to address the sediment. Since sediment is associated primarily with certain red wines and wines held for a long period, it is currently less of an issue. Most wines served at home today are young, and have not built up any significant sediment. Even with the traditional method of decanting, there are a number of choices. Decanters range from glass to cut crystal. 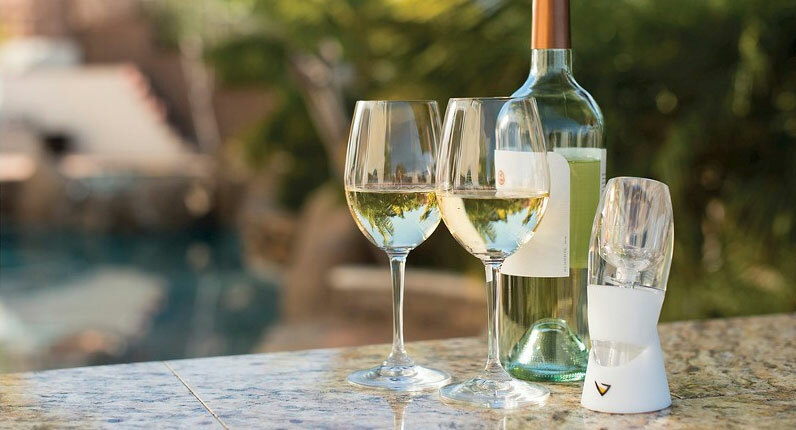 Technology has even brought us a top-of-the-line ‘smart’ decanter that electronically adds oxygen to your wine to reduce decanting time, has programming capabilities and features a wine app. For your less formal occasions, or if you simply cannot allow enough time to decant your wine, choose the more modern aerators. For the least fuss and mess, opt for an on-bottle aerator that attaches to the mouth of the bottle and aerates the wine as you pour. You can also choose a handheld type that you hold over the glass as you pour. In addition, even battery-operated and electric models are available. These units will transfer your wine through a tube into a glass or decanter and oxygenate it during the process. All you do is push a button! Before purchasing an aerator, you should consider the following factors. Will you be pouring red or white wine? Most white wines are enjoyed while young, and have very few tannins, so many sommeliers and oenophiles choose not to aerate them. 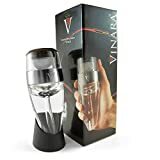 However, to maximize the flavor of even young white wines, you may want to consider one of the rapid-acting on-bottle aerators and consider a purifier to remove sulfites. Or, you may be interested in the separate line of precision aerators Vinturi specifically developed for white wines. If you are enjoying a red wine, virtually all benefit from some type of aeration, and usually a lengthier period of time than white wines. Those with the heaviest tannins, or vintages 10 years or older, improve the most with both aeration and when decanted to remove sediment. Everything, including wine accessories, provides a style choice today. For a more elegant presentation, decanters are the first choice. However, you can combine traditional crystal decanters with one of the modern aerators to get the best of both worlds. Serve your wine in the decanter, but take only minutes, instead of hours, to oxygenate it. Aerator sets with their own decanters are also available, making it easy to get the best of both methods at one time. Aerators also come in a broad range of colors, sizes and shapes. 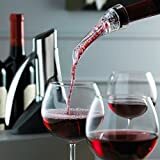 You can choose everything from a simple acrylic or stainless steel and black rubber on-bottle pourer or oval acrylic handheld aerator, to a smart glass decanter with a burgundy base unit. Consider what your presentation needs and storage capacity are, and you will find one that also accentuates the rest of your home décor. 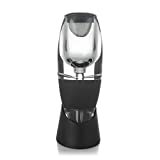 Usage varies depending on the style of your aerator. Let’s us share some usage tips for each style so that you will be able to use them all! Perhaps the simplest devices, handheld aerators are named for their functionality. Hold the unit directly over the decanter or individual glass you are filling, and pour the wine through it with your other hand. Also simple in design, on-bottle pourers are inserted in the mouth of the wine bottle itself. Then you pour the wine directly into the decanter or individual glass as you normally would. These aerators act as a pump. You place a tube into the wine bottle, and seal it with the aerator unit. Then place your individual glass or decanter under the spout. Press a button and the wine is oxygenated as it flows into your decanter. Manually decanting a wine requires a little extra attention. Your bottle should be chosen a day in advance so you can store it upright and allow any sediment that may have developed on the side to move to the base so it is easier to separate. After you remove the cork and wipe the mouth of the bottle, slowly and steadily pour the wine into the decanter. Then slow down even more once you’ve poured half the bottle. You may want to have a candle or flashlight held near the neck of the bottle so you can observe when you’ve reach a portion of wine with sediment. Then let the wine rest until it is time to serve. This innovative electronic decanter eliminates the lengthy resting time of a conventional decanter. In order to remove sediment, you would still have to slowly pour the wine into the unit’s decanter. Similarly, if you wish to remove sulfites, you might want to place a wine purifier atop the decanter. However, once the wine is poured, you simply take a picture of your wine label with your phone app, and it programs your unit for the appropriate time and amount of oxygen to infuse. Press a button to start or stop. You are ready to drink your enhanced wine immediately. The length of time for aeration varies from wine to wine. White wines and young red wines between two and 10 years old generally only require about 30 minutes. Older or more robust red wines may take two to three hours when decanting. Aeration devices generally reduce the time for all to a few minutes. If you need the most accurate determination, a smart aerator is for you – just scan the bottle and input the name, year and vintage into the app before you start. Most of the handheld or on-bottle models can be washed by hand or even placed in the dishwasher. Similarly, tubes for the electronic styles will need to be rinsed out. As with most bar accessories, rinse it right after you have finished pouring for the easiest cleanup. If you drink older wines, or discover you have any clinging sediment when you clean, you may want to add a small wine brush to your tools to remove any buildup. Models with towers or bases will also need to be wiped off with a soft cloth. Cleaning a decanter, especially one of crystal, is a little bit more difficult. After initially rinsing out the decanter, you may find there are stains that are hard to reach through its narrow neck. When that happens, create a solution with a soft dish soap, or a natural cleaner like white vinegar, and water. Add the solution along with something that will scrub the inside like rice. Swirl the decanter periodically for up to a couple of days until the stain is gone. Then use your bottle brush on the neck and base, and rinse with water. Once the stain is gone, you may want to sanitize the bottle by adding a small amount of bleach to water, pouring it into the decanter and letting it sit for about 15 minutes. Remove the bleach water and rinse thoroughly, and you’re ready to enjoy your next bottle. Ultimately, whether you prefer white or red wine, in order to ensure you maximize your experience, aerate your wine. To enhance the simple pleasure of an evening glass of wine, choose an on-bottle pourer or handheld model. 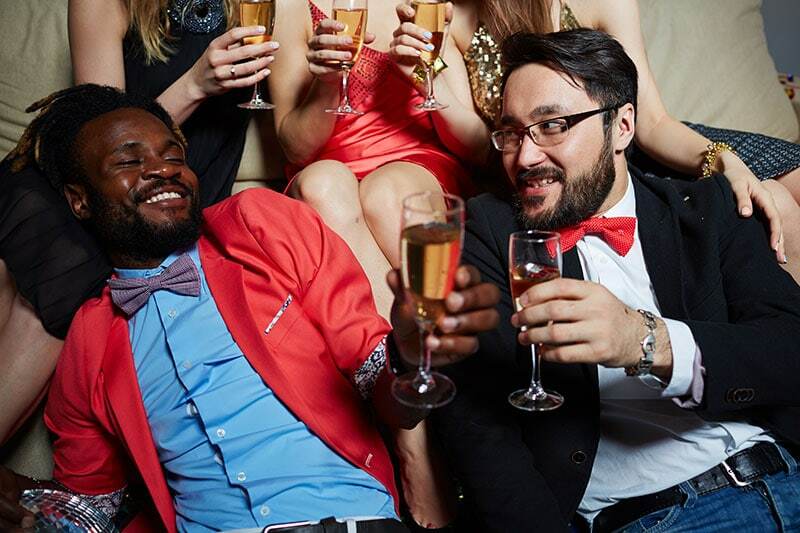 If you are entertaining and will use one or more bottles, consider an electronic version. If you want the top-of-the-line model with the best presentation and most precise oxygenation, choose the smart decanter. Get the most out of the dollars you spend for your wine, as well as the grapes harvested to create it, by aerating! Thanks for helping me to learn more about these things. I just got into wine after my daughter got me a gift basket with some in it. Was having such a hard time deciding on Amazon. Used your list to pick one that works for me. I didn’t know if I really needed an aerator or not before reading this, but you’ve cleared up all the confusion. Now to see if I can get an aerator under $100 to fit my budget this month.